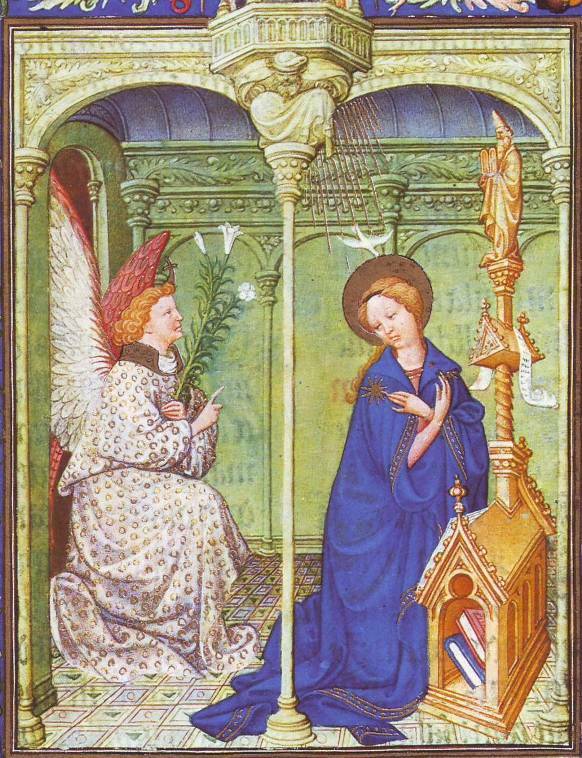 In this miniature painting (above), the Angel Gabriel, his wings moving and his cloak stirred, enters the Virgin’s chamber through the open arch and falls on one knee to ask her if she is willing to become the mother of the long-awaited Messiah. As a messenger from God, the angel often carries a scroll or a staff. Here, however, he holds the large lilies that are usually placed in a vase beside Mary as a symbol of her perpetual virginity. Click on image below to see enlargement. The angel looks up and points to the dove descending in a shower of golden rays – the Holy Spirit, of course. 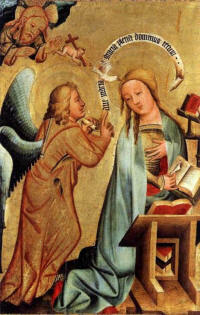 The kneeling Virgin does not look directly at the angel, but casts her eyes down modestly. With equal humility she crosses her hands on her breast, as in Italian paintings of the period. The stars on her cloak suggest that she is already part of the universal plan of God, as the stars are. The painting preserves the tradition that when the angel appeared the Virgin had been reading a Messianic prophecy from Isaiah: ”Behold a virgin shall conceive and bear a son . . .” Here she kneels before a lectern with an inscribed scroll that perhaps represents that text. According to the apocryphal gospel of Pseudo-Matthew the Virgin was ”the best informed in the law of God . . .” In the miniature her lectern is appropriately topped by a statue of Moses holding the tablets of the Law. A book lies open on the lectern, and there are two more volumes below. 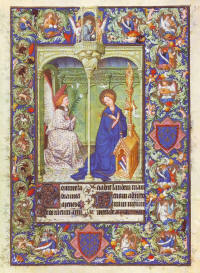 Earlier French representations of the Annunciation show a single book; the open cupboard containing books beneath the lectern appeared earlier only in the Hannover altarpiece by Meister Bertram of Hamburg. God the Father occupies a projecting balcony supported by a caryatid who may represent a prophet . Although God the Father is a comparatively small ﬁgure his color, gray-violet, inﬂuences the design, reappearing in the ceiling, the shadows in Gabriel’s mantle, and the tiles of the ﬂoor. The Virgin’s signature color, blue, is repeated in the exceptionally rich and strong border. If you look at the image below, you will see that the border of the picture contains emblems we might expect: angels and prophets. But is also shows some rather odd items: swans, bears and even snails. These were emblems in the coat of arms of the Duc de Berry, and the artist tactfully included them as a tribute to the patron of his work.